Sports injuries are common in Malaysia. We have seen a fair share of injured weekend warriors as well as injured professional athletes. In almost all cases, injuries were due to exhaustion resulting from electrolyte imbalance that could have easily been prevented. To help Malaysia's live a healthy active life; this Chiropractic-in-Malaysia article will shine a light on how you can prevent sports injuries in Malaysia. In Malaysia, heat exhaustion is the leading cause of most sports injuries. Heat exhaustion is a faint-like collapse after exercise that results from low blood pressure. The best means of avoidance is proper hydration with electrolyte infused drinks such as 100plus or Gatorade. Proper hydration is important in keeping up with the nutritional demands of your body. But, most important is to avoid empty liquids such as distilled water or even some of those bottled waters. Drinking water may not be enough, so don't just look to quenching that thirst, go for liquids with maximum power. Another key point to remember is that alcohol and sports don't mix. Far too often we see people drinking beer in golf, tennis or other sports. Keep alcohol away from any sport or outdoor activities. It is better for you and your friends. Additionally, it might even be better if you avoid drinking alcoholic beverages the night before a sporting event. Alcohol wipes out all the electrolytes in your system. You may not feel the impact right away, but you could very easily end with a serious life threatening health issue on the field the day you play. Play safe and alcohol-free. However, if you happen to fall victim to heat stroke or heat exhaustion, there are things you can do to make you feel better and even avoid a dangerous life threatening situations. Heat exhaustion athletes can recover rapidly on lying down with leg raised to improve blood pressure. Heat stroke victims collapse during exercise due to impaired body temperature control. Heat stroke is potentially fatal if immediate first aid to lower body temperature is not provided. Follow the steps below if an athlete is showing signs of heat illness. Remove the person from the field and lay him/her down with legs and pelvis raised in a cool place. Remove excessive clothing and cool the body by wetting skin and vigorous fanning. Apply ice packs to groin, armpits and neck to increase cooling effect. Provide cool water if the athlete is conscious. For heat stroke victims, he/she should be cool in a shallow plastic bath of iced water for (5-10 minutes), and cooling treatments should be continued till the arrival of the ambulance. There are a few steps to minimise the risk of heat illness. Athletes have to stay hydrated to control their body temperature. Drink about 500ml of electrolyte-infused liquids 2 hours before the sports activity. 500-750ml of cool electrolyte-infused water or sports drink needs to be consumed every hour for activities lasting for one hour or more. Reduce the exercise intensity if you feel uncomfortably hot or if your skin is dripping wet all over with sweat. 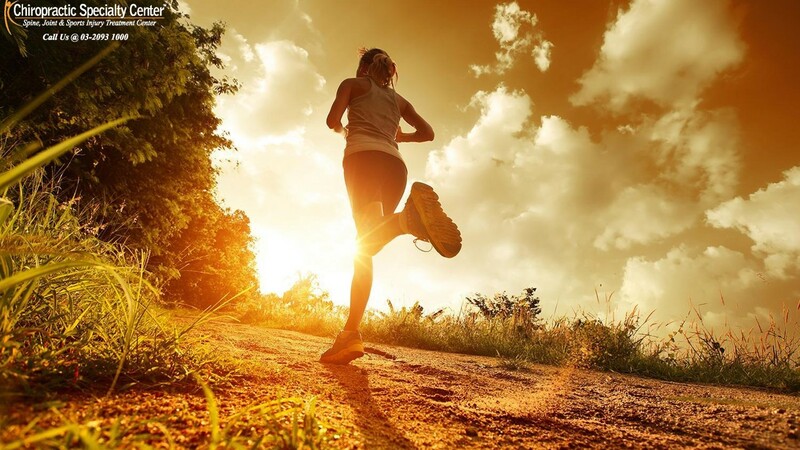 Regular endurance training in warm conditions to acquire adequate physical fitness and acclimatisation to heat decreases the risk of heat illness. Always wear light coloured, light weight, loose fitting and UV-protected clothing which allow easy sweat evaporation. Heat exhaustion is the leading cause of sports injuries in Malaysia. If you happen to be the unlucky one who got injured, we can help. We have the best clinical physiotherapy for sports injuries in Malaysia. Call our main center at 03 2093 1000 for more information about sports injuries and world-class theapy options available right here in Malaysia.